"Reach for the stars," is just one of many (American) English sayings about goals. Have you ever wanted something that was placed high on a shelf? Perhaps in order to get that item you had to stand on a chair and stretch your arm to touch it. You reached for the item. When something is far away from us on a shelf or table we have to reach for it. Here's another example, let's say you live in Santa Barabara, CA and you want to visit San Diego, CA. So you leave your home and start driving (or maybe you take a bus), when you finally arrive in San Diego, you reach San Diego; you reach your destination. 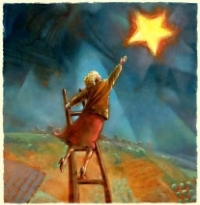 What goals (stars) are you reaching for? To improve your English vocabulary so that you can express your ideas; perhaps it's to communicate with your colleagues. Or maybe it's to study abroad in an English speaking country. My goal is to help my others achieve their English language goals. I do this by listening, thinking of new ways to help people learn and communicating clearly. Are there sayings about goals or stars in your native language? What are your English language goals? Share them in the comments section below.